It should be quite clear for those who live outside the Matrix what the long term solution for the U.S. debt load will be - stealth default. That is weakening the dollar over the long run, and paying back our creditors in dollars worth (far) less than they are today. All the while government officials will talk up "strong dollar policy" while we can smirk to ourselves. And when the dollar does sink we will be told is is great for us, so that a small band of multinationals can export more "creating jobs" (in China and India), and deriving huge profits to a very small band of the populace. Sure, during periods of global crisis the greenback will rally but I am speaking 10-20-30 year cycle. Therefore it is imperative investors of the American kind find way to compensate for the grand theft occurring. For example, the investor who lives in a nominal world thinks the market returns thus far in 2011 are pretty cool. But overlaid with the losses in her purchasing power, (i.e. real returns) she is essentially flat lining. Those poor suckers stuck in CDs and savings accounts? Losing money on a real basis. Obviously gold, silver, other commodities, other currencies (franc, aussie dollar, et al), even stocks have been places to try to avoid this theft. Just looking at the U.S. dollar index as a whole also is misleading as the main counterweight is the highly flawed euro. [Dec 23, 2010: Is the U.S. Dollar Weak or Not?] An ugly duckling contest that overstates dollar stability. 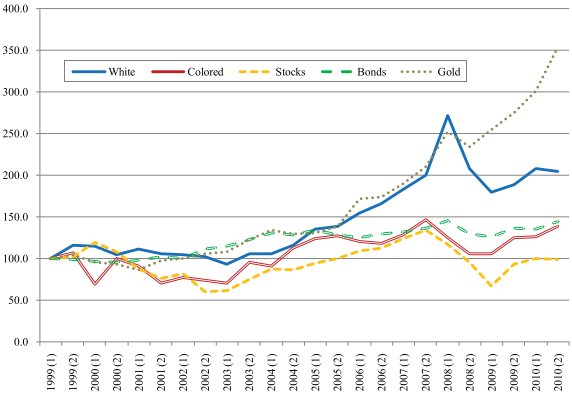 The following chart, taken from the paper, compares cumulative real price indexes for white diamonds, colored diamonds, stocks, government bonds and gold measured at six-month intervals over the 1999-2010 sample period. For all asset classes, indexes are normalized to 100 for the first half of 1999. White diamonds outperform stocks and government bonds, but not gold, over the sample period. Colored diamonds beat stocks and perform about as well as government bonds. Equity market shocks tend to depress the gem market. Do gems offer good returns? How do the returns of these tangible assets compare with those of other asset classes? In the April 2011 version of their paper entitled “Hard Assets: The Returns on Rare Diamonds and Gems,” Luc Renneboog and Christophe Spaenjers examine recent returns on precious gems in U.S. dollars. They concentrate on the upper end of gem quality for three categories: white diamonds, colored diamonds and other gems (emeralds, rubies and sapphires). Transaction frequencies are 2,033 for white diamonds, 1,086 for colored diamonds and 832 for other gems. White (colored) diamonds generate an annualized gross real return of 6.4%, compared to -0.1% for stocks, 3.3% for government bonds and 11.6% for gold. Negative gross real returns occur during subperiods related to the dot-com bust and the recent financial crisis, but subsequent rebounds more than compensate (see the chart below). Based on gross Sharpe ratio, white diamonds substantially outperform stocks and match government bonds. Gem returns relate positively to stock market returns, suggesting a stock market wealth effect. Since 2003, annualized gross real returns are 10%, 5.5% and 6.8% for white diamonds, colored diamonds and other gems, respectively. Corresponding annualized gross nominal returns are 12.6%, 8.0% and 9.5%. Returns may be slightly greater on average, but also more volatile, for higher-quality gems. In summary, evidence from a limited recent sample period supports a belief that gems tend to appreciate at rates roughly comparable to those of other asset classes. As noted in the paper, the sample period is short, especially in terms of market shocks. Supply metering by the principal source of diamonds (de Beers) affects realistic return on investment calculations over long periods. Reported returns are gross, not net, and transaction costs for gem auctions (principally, the auction house commissions) are very large (on the order of 10% of price each way) compared to trading frictions for stocks, bonds and gold. While a long holding period would mitigate, these transaction costs would make net returns to investors materially lower.